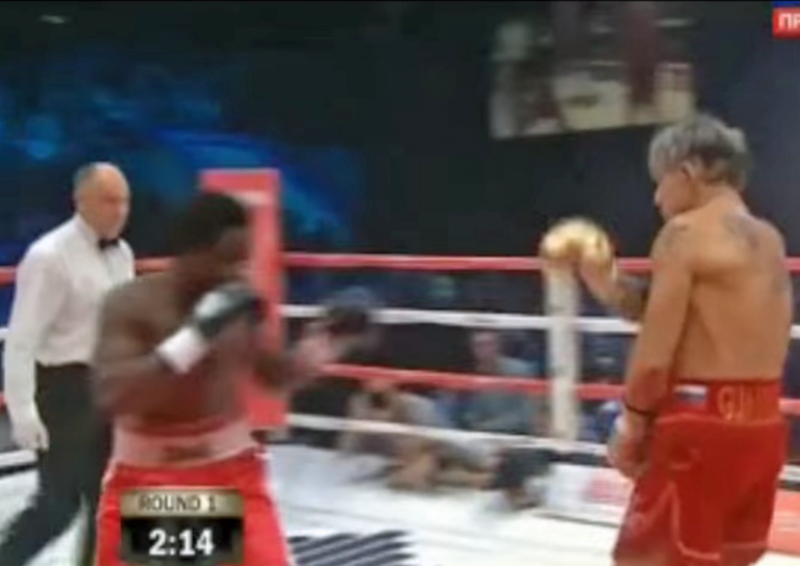 On November 28, 2014, 62-year-old Mickey Rourke fought an exhibition match against 29-year-old Elliott Seymour in Moscow. It’s difficult to fathom what motivated the aging actor to participate in such a “match” against a decades-younger opponent. Rourke ended his original boxing career at the age of 21. 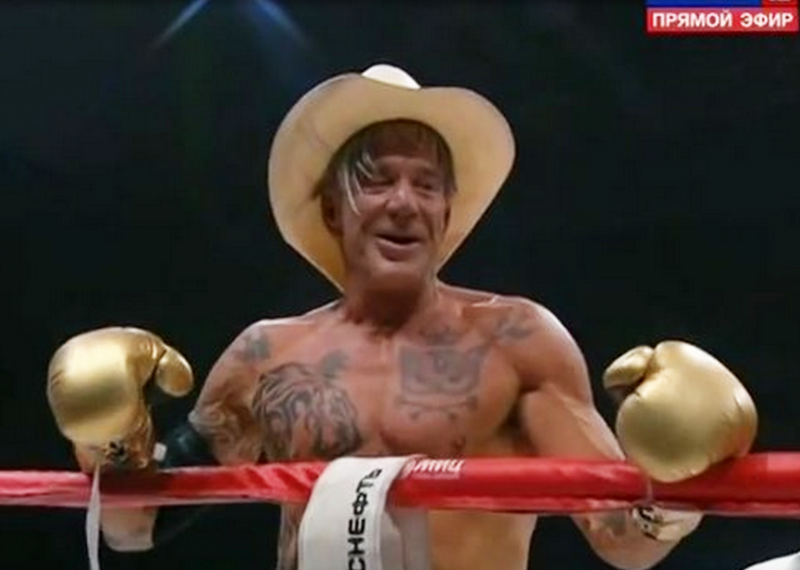 Mickey Rourke entered the auditorium a-la Burt Reynolds in “Striptease,” wearing a cowboy hat, a fringed red robe, gold-colored boxing gloves and a set of cowboy-shaped booties. Rourke wearily pranced about the stage, half-heartedly throwing a few air punches to impress the receptive Moscow audience. He bounced against the ropes and winked to the camera. Seymour, for his part, looked resigned to his pre-determined fate and did his best to keep a straight face. During the cringe-worthy performance, stiff and lethargic Rourke frolicked about the boxing ring in red trunks emblazoned with a Russian flag. He delivered a few flimsy body shots. Seymour flung himself down, movie-style, in an overblown response reminiscent of the ending in the film “Bowfinger.” Rourke offered the poorest imitation of Muhammad Ali’s rope-a-dope and knocked Seymour down twice before the referee stopped the fight. In spite of a lame performance, it’s unlikely that the audience will ask for its money back. After all, show trials, ridiculous government propaganda and faux performances are par for the course in Russia. Earlier this year, Mickey Rourke demonstrated his newfound love for Russia’s President, Vladimir Putin, by wearing T-shirts with his image. The actor has been romantically linked to a Russian-born model, Anastassija Makarenko. Rourke reportedly hopes to do four more fights in Russia, as another pawn in Putin’s ploy of using washed-up Hollywood action stars in a bid to legitimize Kremlin’s dubious foreign policy.